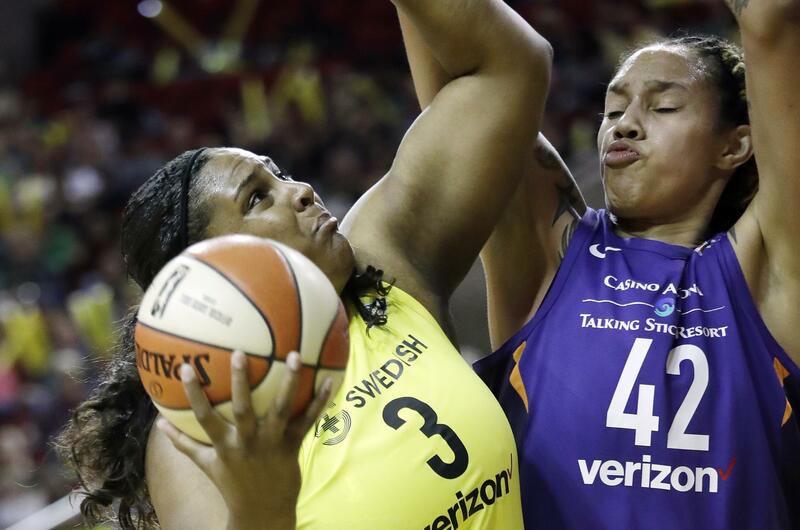 SEATTLE – Brittney Griner had 29 points and 10 rebounds to help the Phoenix Mercury hold on for an 87-82 victory over the Seattle Storm on Sunday night. Griner, who led the WNBA in scoring and blocks per game last season, shot 10 for 16 from the field and added four assists and three blocks. Briann January (Lewis and Clark High School) finished with 15 points and six assists, while Diana Taurasi and DeWanna Bonner scored 12 points apiece for the Mercury (2-0). Sue Bird hit a jumper with 1:21 to play and Jordin Canada had a steal and a layup before Natasha Howard made a basket to cap a 6-0 run that pulled Seattle (0-1) within two points with 24.8 seconds left. After January’s free throw made it 83-80, Breanna Stewart answered with a layup, but Taurasi hit two foul shots to push the Mercury’s lead to three with 9.8 to go. The Storm committed a turnover on their next possession and Bonner hit two free throws to cap the scoring. Stewart led Seattle with 22 points, 15 rebounds and three blocks. Phoenix led by 10 after a layup by Griner midway through the first quarter and Sancho Lyttle’s layup made it 50-36 early in the third quarter. Published: May 20, 2018, 9:18 p.m.